Many of the ways you can use Story Maps are obvious, but others aren’t. Here’s a list of interesting things you can do with Story Maps that you might not have thought of before. Click the image to open the story map, or to learn more. Annual reports deliver a comprehensive summary of a business or organization’s activities throughout the preceding year. Annual reports can cover a wide variety of activities, lots of different media, and can be enhanced with maps. This example from Rotary International uses Story Map Cascade to provide an overview of activities and milestones achieved over the past year. This annual report from Conserve Wildlife Foundation of New Jersey uses Story Map Journal. 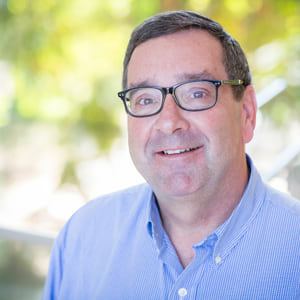 In a similar fashion, Esri business partner Pro-West & Associates also uses Story Map Tour to introduce their employees, their skills, and their interests. You can introduce yourself using a Story Map as an interactive resume. This example from Leilei Duan uses a Story Map Series (with the side accordion layout), providing a compelling way for prospective employers to not only learn more about Leilei, but also see her GIS work through interactive maps. This next example of a GeoResume uses Story Map Journal to profile accomplishments and projects using a mix of media and maps. Since Journal organizes things into section, this enables a logical arrangement of important resume facts and examples. This example uses Story Map Shortlist to highlight an arts festival near Paris, France. This Story Map Journal promotes the Philadelphia Marathon and includes maps of the course with elevation profiles. A Story Map can be used to showcase your business activities, or projects your organization has completed. The town of Yountville, California, uses a Story Map Tour to highlight their planned, current, and proposed development projects. Not just for government organizations, private industry can also benefit from Story Maps. This Map Tour is used by Bergmann Associates to showcase their portfolio of architectural, engineering, and planning projects. This Story Map Cascade is part of a series on How to Smart Map. This installment covers creating heat maps. Story Maps are an excellent way to deliver educational media and text. The example below, made using Story Map Journal, uses a combination of videos, images, and interactive maps to explain the motion of the earth’s tectonic plates. The opening video is especially interesting. Washington Geological Survey uses Story Map Cascade to explain and educate viewers about how lidar is used to expose hidden geology and natural hazards. This Story Map contains a series of swipe transitions, comparing aerial imagery with the lidar. Real estate is all about location, location, location, as the oft-spoken conventional wisdom goes. It’s the single most important factor in the value of a property now, and into the future. And what better way to show location and describe real estate value than a Story Map? Below is a showcase of available commercial properties using Story Map Shortlist. Viewers can click a tab to show various types, such as retail, office, industrial, and development property, then click the property details to learn pricing and visit the listing website. This Story Map Shortlist, by Cushman & Wakefield | Commercial Advisors has been customized to include Google analytics and a custom header. It’s also embedded on their website and shows the locations of a variety of property types. Whether it be a guide to historical locations within a city, great restaurants, or parks and preserves, Story Maps can provide interesting and useful ways to deliver a guide to things of interest. And since Story Maps are responsive, the same app can be used on a browser or device. 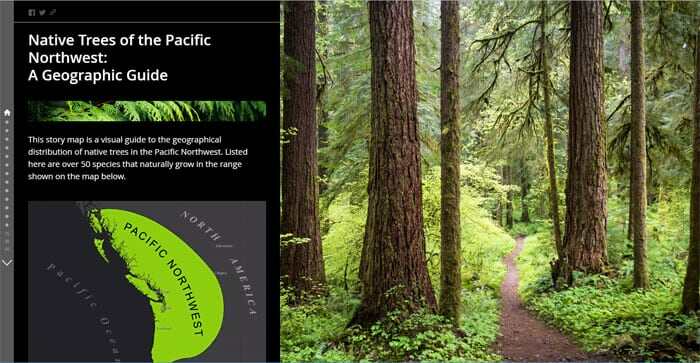 A visual guide to the geographical distribution of native trees in the Pacific Northwest, this Story Map Journal documents over 50 species,, and uses story actions to create a table of contents for navigation. This Story Map Tour by the Florida Department of Environmental Protection is an online guide to Florida’s aquatic preserves, with photos, descriptions, and links for more information. Whether you’re an elected official keeping your constituency informed of your activities, or rallying supporters for a political cause, Story Maps can be an effective way to reach your audience. Pennsylvania Congressman Lou Barletta’s “Main Street Tours” uses Story Map Tour to highlight where he’s been out at town halls. The Story Map is embedded in his website. The Grand Canyon Trust is a nonprofit organization dedicated to Grand Canyon and Colorado Plateau conservation and environmental advocacy. Their website embeds several Story Maps and other configurable apps to inform and engage the public. Friends of the Verde River uses a Story Map Cascade to introduce their mission, familiarize viewers with a makeover, and introduce staff. Activism strives to create change in society, whether it be social, political, economic, or environmental. Story Maps provide a way to deliver a message in compelling ways, leverage media and narratives, and often include a call to action. Below, Earthjustice embeds a Story Map Cascade to make a case against the Dakota Access pipeline. Another Story Map Cascade from Listen To The Amazon is intended to alert national and international communities about the impacts of the Orinoco Mining Belt. The Story Map uses both English and Spanish text. The Atlas for a Changing Planet, shown below, uses Story Map Journal to deliver interactive maps, graphs, and media to document our changing planet. It embeds other Story Maps within it, and also includes time-enabled maps that demonstrate change over time. This Demographics and Statistics Atlas for the United States is a Story Map Series using the tabbed layout, that embeds other Story Map Series that use the side-accordion layout. The tabs are used to group topics, the subsequent side-accordion Story Maps present maps showing different demographic details for each topic. The Massachusetts Emergency Management Agency (MEMA) uses a Story Map Series (tabbed layout) to show current weather conditions along with other dynamic data at their Emergency Operations Center (EOC). 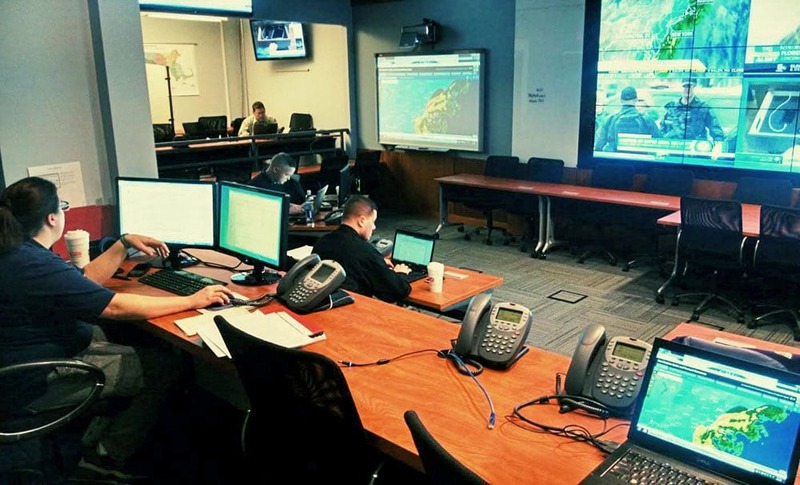 The photo below shows the MEMA EOC with the Story Map displayed on the wall monitor at left front, and also on the laptop in the right foreground (photo courtesy Desiree L. Kocis, MEMA). The Story Map used in the EOC, shown below, uses live feeds from NOAA and other sources from the Living Atlas, along with weather feeds and forecasts provided by Accuweather. In this case, the Story Map Series is like a binder—it binds together multiple applications into a single app. During events like hurricanes or earthquakes, there are usually a variety of maps, apps, and layers that are authored and published. To catalog these in one app for viewers to open and bookmark, a Story Map Series (side accordion layout) was used. A newsletter delivered as a static web page, Word document, or PDF can be boring, but you can bring it to life in a story map. This example from the Virginia Department of Transportation GIS User Group uses a Story Map Cascade. 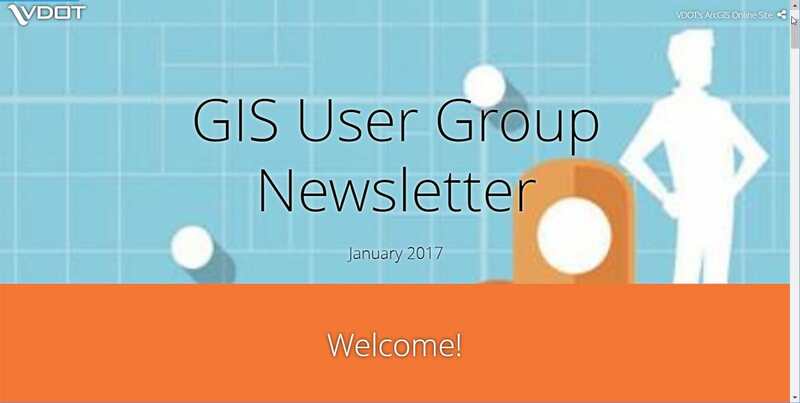 Not only is the newsletter more fun, but live maps and apps can be easily featured. Story maps can be easily embedded into your website, adding interesting content and interactivity. Sometimes there’s not much else except for the embedded story map, making it the primary building block of the page. Is it a story map embellished with the addition of a web page, or a web page built using a story map? That’s hard to say, but what’s easy to say is that this is a very interesting and useful technique. The International League of Conservation Photographers (iLCP) uses their standard header plus an embedded Story Map Cascade to create web pages on their site about their photographic expeditions around the globe. This page is about the Palau expedition. The USGS has created something similar, in this case using a Story Map Journal embedded in a web page with only a header and footer. Shown below is Great Lakes Mercury Sources Revealed. Note the header and footer above and below the embedded Journal. More than just a navigable map in a news story, a Story Map can add additional context and capabilities to enhance any online magazine or news journal. 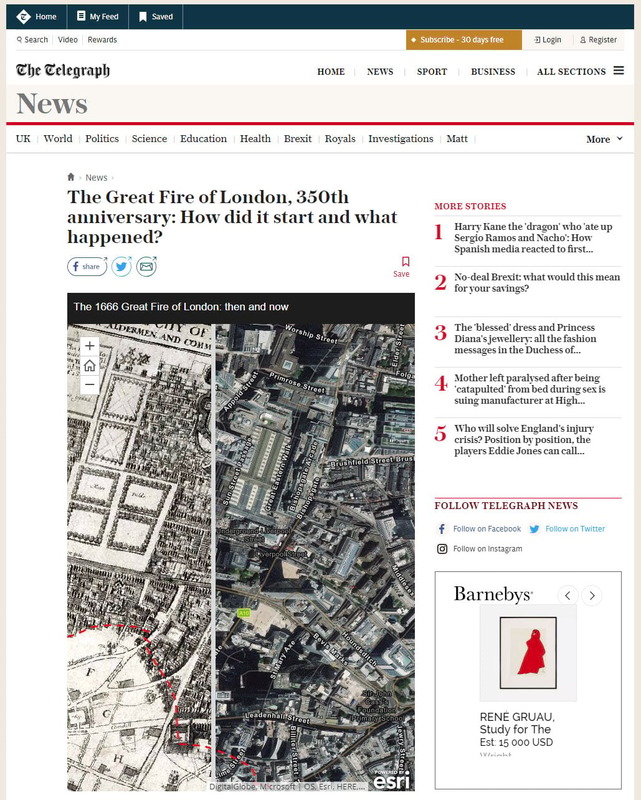 The Telegraph (U.K) published an article on the 350th anniversary of the Great Fire of London. A Story Map Swipe was used to compare present day London (using Living Atlas imagery) with a 1666 map. 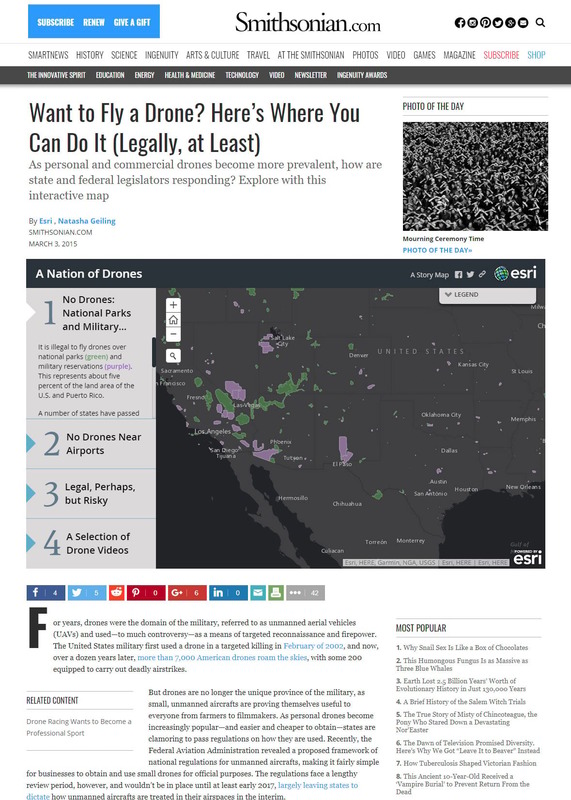 This example from Smithsonian uses a Story Map Series, side accordion layout, to provide readers with maps of where drones can be flown. Yes, it’s true. Story Maps have even been used for wedding invitations. But what better way to add a map and directions to the venue, along with photos and more about the lucky couple? There’s lots of unique and interesting ways to use Story Maps, some obvious, and some not so obvious. But with a little creative thinking you’ll discover many ways to apply Story Maps for your presentation, communication, or visualization needs. This post highlights some of the ways they can be used, what do you do with Story Maps? This post was originally published on February 16, 2016, and has been updated.